At first glance the two things I like most about the official Google Voice application is label access and voicemail playback (which highlights words in the text transcription as it plays). It also feels snappier. 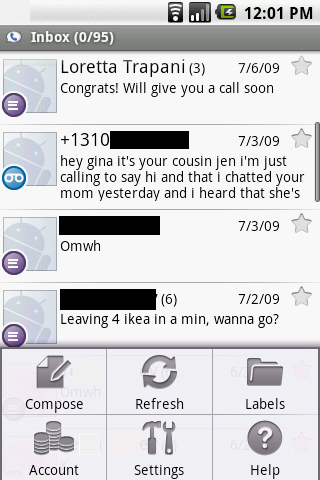 Over at Lifehacker, Kevin runs down what you get with the Google Voice apps on both Android and BlackBerry. Here’s Google’s official announcement video. Grab Google Voice for Android in the Android Market on your handset. As for iPhone owners, a former Googler implied that Apple’s approval process may slow up your Google Voice app. So hang in there and be patient–no doubt it’s coming. That’d be great for me, if the official app actually supported those of us with GAFYD accounts instead of @gmail.com Google Accounts. Once again (Maps Editor, Finance, Picasa) Google fails to deliver on Android for a userbase it expects to earn money from. Gmail on Android works, why doesn’t anything else? After years of waiting, I’ve finally gotten a Google Voice account. I really have to say that, without a native app for your smartphone platform of choice (mine being the Palm Pre), Google Voice isn’t really ready for prime-time. Your Google Voice number can’t really be your one and only point of contact if it means that you can’t use the native SMS client on your smartphone. The mobile-friendly site is pretty good for making calls, but there’s much more to Google Voice that you can’t yet manage on-the-go. I’m sure that Google is working on it. Even with it’s current limitations, GV is a revolutionary product for the tech-savvy small business owner, or anyone who needs to mix business and pleasure on the same phone. Doesnt Google already have all my life on it (mail,chat,search history, maps, locations and now the tasks)? Now it wants my voicemail and phone conversations ?? Well, The offer is pretty enticing.. But I will Pass on this [:D]…. @Mike: I wrote this post for you, re: how to SMS from your Pre.